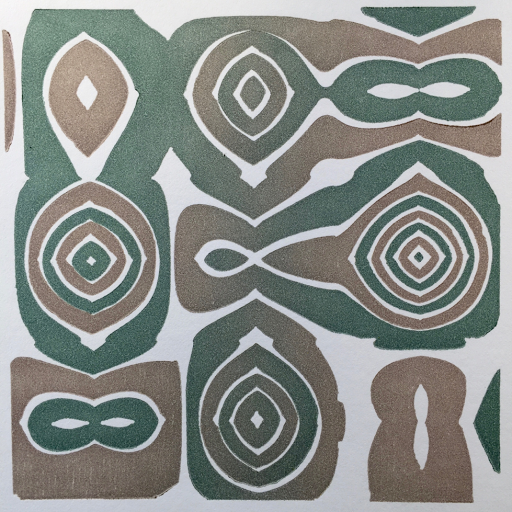 When printing multiple layer of ink, embossing on a lower layer affects how the upper layers transfer ink. The result is that there are edges with too much ink because it’s being pushed into the crevice. There are other edges with too little ink because the block couldn’t reach the paper or because there was less pressure in the crevice. 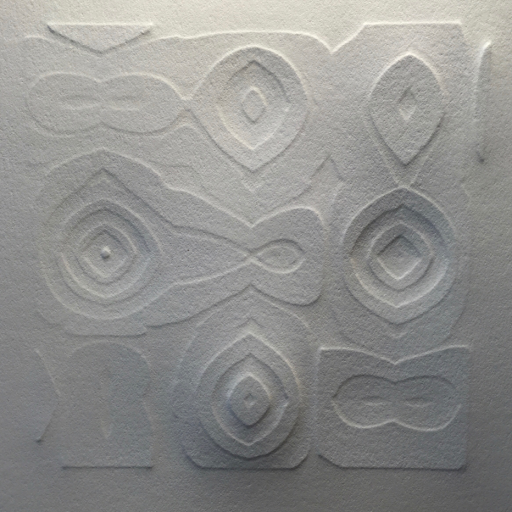 Here is the type of embossing that I was going for. In this photo, shot from the back side of the paper, I’ve lit it from the edge to exaggerate the embossing. 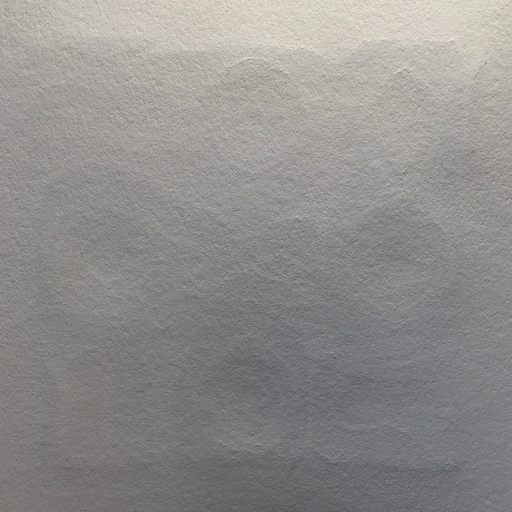 You can see that the bullseye patterns also distort the paper into small mounds because of the paper stretching in that particular area. After changing the order and type of press blankets, I’ve achieved a reasonably low amount of embossing while maintaining excellent pressure to transfer the ink. Again, this image is exaggerated. In person, the embossing is barely discernible. Here is the result. See? The ink is transferred very well, even without embossing. And here’s how I did it. I’m sort of solving two problems at once here. The first problem is that the specialized rubber press blankets from Whelan Press are not available since they went out of business. 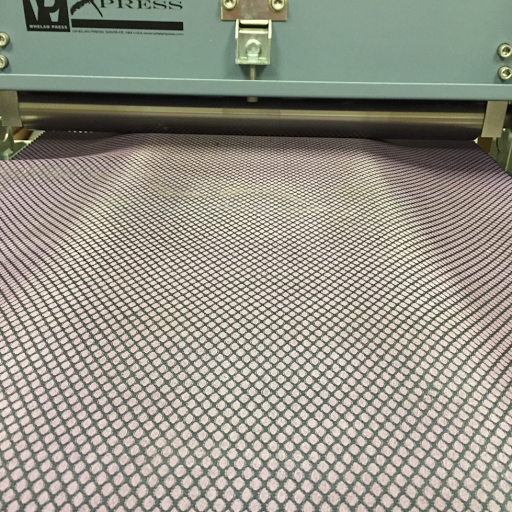 This rubber blanket is vital to printing with this press because the upper roller moves vertically and uses springs for pressure. 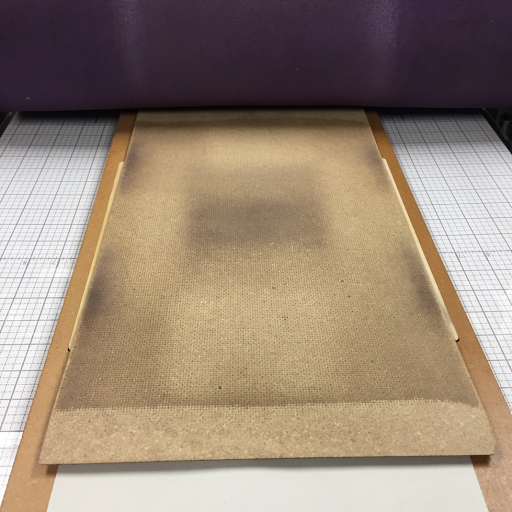 It can be tricky to get the roller up onto the printing surface under high pressure. The thickness of the blanket helps the roller to get up onto the block. To solve that problem and to solve the problem of replacing the rubber blanket, I bevelled the edge of a piece of masonite. With a ramp to help the roller climb, I can get away with a thinner rubber blanket. And, with a retreat center down the road, I have a never-ending source of discarded yoga mats! The masonite presses hard against the wood block with no cushioning to push the paper into the spaces between the block relief. 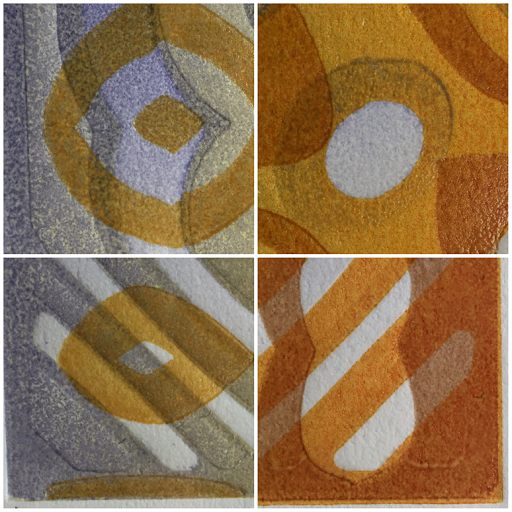 With only two layers of blankets to manipulate between prints, I can work much faster and with much better results. It’s one tiny step at a time, but I’m getting the hang of this!